Based on the WavePro 7 Zi Series models, the DDA 7 Zi Series Disk Drive Analyzers are available in 3.5 and 6 GHz models and come equipped with 20 Mpts/ch acquisition memory. Dedicated disk drive measurements, trigger and zooming for failure analysis, and serial data measurement capability with a Disk Drive Analyzer user interface are also standard to address high capacity disk drive designs. Operate in either DDA or SDA mode to analyze the serial data links or the physical media behavior on a hard drive. LeCroy Disk Drive Analyzers (DDA) assist data storage design engineers by integrating tools that improve the time to market of new products and accelerate understanding and failure analysis on existing drives. LeCroy continues that tradition with the DDA 7 Zi Series equipped with its powerful Disk Drive Analysis toolset. 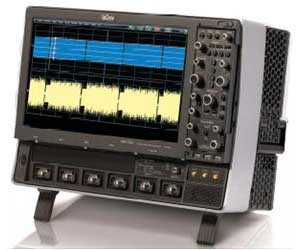 Capture, view, and analyze the wave shape of high-speed, complex drive signals with speed and integrity. Data Storage applications are memory intensive as capturing multiple sectors or a complete track of data can be important in troubleshooting a design or characterizing media. The X-Stream II architecture enables fast and accurate measurements and analysis of disk drive signals. Memory can be extended to 128 Mpts/Ch (256 Mpts/Ch on 2 Ch) using Option L. Both the DDA 760Zi and DDA 735Zi offer the convenience of selectable 50 Ω or 1 MΩ inputs. The standard 20 Mpts of waveform memory and 40 GS/s capture on two channels, means multiple drive sectors can be acquired at once.